Chevy has a new 2016 sports car lineup sitting on Chevy dealerships that’s the best one yet, and it’s worth talking about. The Camaro and Corvette have never performed better, and the SS Sedan being offered by Chevy is an alternate approach for to branch two different markets. There are no flaws with these cars; only many great aspects. Each previous model being precisely tuned and calibrated over the years to bring these new models to the apex of performance and design. With that being said, let’s take a look at what makes each sports car unique, and what they bring collectively to the Chevy’s 2016 sports car lineup. The 2016 Camaro is a new addition that pays respect to the legacy of muscle-cars. Designers needed to take the modern Camaro body and sculpt it around a much smaller and lighter design to improve handling and performance; all while still keeping the classic muscle-car shape. The result? A monster of a Camaro that’s able to aesthetically please while leaving the competition in the dust. The Camaro kept it’s classic muscle-car shape; and it looks good. Not only does it look good, Chevy took the muscle-car design and kicked it up a notch. It’s contributing to the performance of the Camaro like never before, and designers were able to keep the classic aggressiveness of the muscle-car and put it on a smaller frame, which results in a 390 pound weight loss. This means more responsive braking, handling, and overall nimbler performance. Take the aerodynamics of the new design and combine it with the weight loss, and you have a Camaro the likes of which the world has never seen. Classic muscle-car performance meets upgraded 2016 technology; and that makes for a powerful Camaro. The SS trim is the fastest one in history, and for good reason. The famous V8 is back, and it’s a 6.2-liter LT1 engine that puts out 455 horsepower and 455 pound-feet of torque. The Camaro will accelerate from 0-60 in 4 seconds flat when equipped with the automatic transmission, which is record time for a muscle-car. Don’t worry, it still has the same throaty growl when you step on that gas pedal, even if everything about the performance is different. The long loved Stingray is the trimmed and toned brother of the Camaro; where the Camaro is aggressive and bold the Stingray is poised and refined. Over the years, this pinnacle of driving perfection has been bolstered with new materials and upgraded features. The Stingray is a sister to the Z06 that’s been brought back time and time again. Where the Z06 is race oriented, the Stingray is more focused on blending aesthetics with performance. Providing retired race enthusiasts with a vehicle that has the performance expected from the famous Corvette bloodline, mixed with the practicality of the daily driver. The same familiar curves and angular structure has been kept over the years, and much like the Camaro, it pays homage to the previous generations through this design. Just because this is the daily driver of the sports car lineup doesn’t mean the performance has suffered. The Stingray stuck to it’s roots for performance, and has a classic V8 engine with a few twists. It’s able to put out 460 horsepower and 465 pound-feet torque, screaming down the test track with a 0-60 time of 3.7 seconds. Understanding the ‘Ray would most likely be used off the track (unlike the Z06) Chevy made sure to give it good fuel economy. The 2016 Stingray is able to get up to 29 mpg highway, which makes cruising down the highway “for fun” a possibility, something older gas-guzzling Corvette models could never offer their drivers. If the 2016 Corvette Stingray was geared towards off the track use, that means the Z06 is geared for the track. The Z06 has a long-standing racing bloodline, and has always performed top-notch when the time is needed. With 2016, the Corvette Z06 has yet again been proven on the track as the best performing sports car Chevy has to offer. The performance on the Z06 is something that makes all the others jealous in Chevy’s 2016 lineup, and it’s easy to see why. The Z06 is able to put out a record breaking 650 horsepower, with just as much torque. Making the Z06 a force to be reckoned with if you get stuck next to it on the track. A force that can clock in a 0-60 time of 2.95 seconds, which is the fastest 0-60 track time recorded for a Corvette, or any other car ever produced by Chevy. The Z06 has seen some performance enhancements, much like the Camaro, but they might not be what you’re expecting. In order for drivers to effectively handle the mind-melting amount of horsepower put out by the Z06 engine, they needed to tweak the design a little. Basing the Z06 off the Stingray design allowed Chevy to focus on upgrading precise components of the Z06, like giving it a more aggressive and powerful exterior. Not only did this make it look good, but it helped take the performance up a peg too. Wider wheels and tires were added, and they provide far more grip than the Stingray on the track. Also, the rear and front were widened just the right amount, providing better handling and keeping the Z06 sucked down to the track while the supercharged V8 sails it down the road. Thanks to modern engineering, the Z06 is able to pole-vault Chevy forward in the sports car market, giving the competition a run for their money (and dignity). The 2016 SS sedan is a more recent introduction to Chevy sports car lineup. While it may not have deeply-planted roots like the other models, it’s a strong contender for a whole different type of market growing fast in 2016. The SS sedan is a car that Chevy has put on the map as a sports car for those with a much more refined taste. It’s price, luxury, and performance placing it next to the BMWs and Maseratis on the performance/luxury market. The SS is a much more aggressive looking sedan than the Hyundais or Fords on the market, which is an allusion to the power it has under the hood. It has the basic sedan shape, but it’s kicked up a notch. The front grille and hood are sleek and angled, making it look like a well-sharpened knife cutting through the air. The aggressive curves from the front-end swoop backward onto a curved roof, where the curves plateau for just a second, and then continue on to the back. Completing the aggressive design are the menacing headlights, which angle inward to the prevalent Chevrolet badge sitting on the grille. It’s almost like the SS Sedan is proudly strutting its maker’s mark. The performance of the Sedan might surprise you; and even though it doesn’t have track-proven blood in it, it can still clock-in some impressive numbers. The SS Sedan has a 6.2-liter V8 engine that puts out 415 horsepower and an equal amount of torque, so it’s no wonder this sedan can clock a 0-60 time of 4.7 seconds. That time is only 1 second slower than the Stingray, which has been one of Chevy’s best sports cars over the years. The fact it has a track-time that’s just 1 second behind the Corvette is a testament to just how powerful and well-engineered the SS Sedan really is. What does this mean for Chevy as a whole? It means many things. What this 2016 lineup means for Chevy is they have been able to keep the muscle-car tradition alive and well through their Camaro, continue their racing bloodlines with the Corvettes, and effectively breach into a whole new market with the SS Sedan. 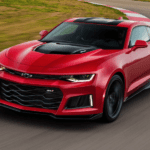 This jump into the new market is sure to create a fresh legacy for the sports car lineup, one where the SS Sedan will eventually have become an honorary member of Chevy’s sports car lineup; just like the other three models.